To mark the seventy-fifth anniversary of the publication of Antoine de Saint-Exupéry’s classic story The Little Prince, the Morgan presents five newly discovered drawings by the author as well as intimate memorabilia from his time in New York during the 1940s. The items belonged to the American artist Joseph Cornell (1903–1972), who met Saint-Exupéry at the very moment the French author-aviator was drafting what would become one of the world’s favorite books. Cornell kept a dossier of papers and fragments that served as echoes of their encounters—everything from a marked-up cocktail napkin to an unpublished sketch of the little prince perched at the edge of a rose-covered cliff. Cornell’s Saint-Exupéry dossier was acquired by the Morgan in 2014 and is now shown in its entirety, for the first time, in the Morgan’s lower level lobby gallery. At the time he met Saint-Exupéry, Cornell had already exhibited his work in some of the earliest exhibitions of Surrealist art in the United States and was creating the shadow boxes for which he is now best known. Saint-Exupéry, a French Air Force pilot and the celebrity author of best-selling books about the poetry of flight, had come to New York during the Second World War, after Germany’s invasion of France, and published The Little Prince just before returning to active duty in 1943; he died the following year while on a reconnaissance mission over southern France. The Saint-Exupéry dossier is one of countless files that Cornell assembled about various friends, historical figures, and themes, forming a dynamic library of everyday ephemera that fueled his imagination and served as source material for his remarkable works of collage and assemblage. Antoine de Saint-Exupéry (1900–1944). 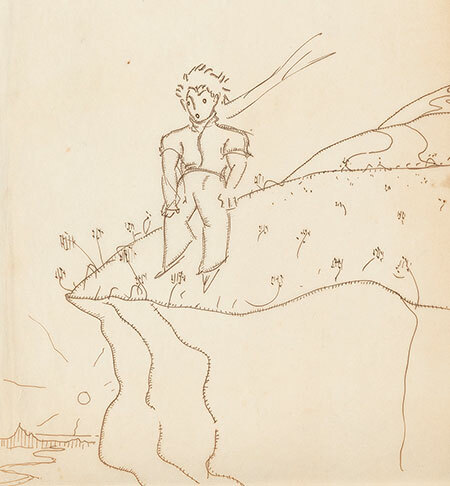 Drawing of the little prince on the edge of a cliff. New York, 1942 or 1943. Pen and brown ink on onionskin paper. The Morgan Library & Museum, New York, purchased for The Dannie and Hettie Heineman Collection as the gift of the Heineman Foundation, 2014. © Estate of Antoine de Saint-Exupéry. Photography by Graham S. Haber, 2017.